on all of the instructions for Shogi. However, because of the dimensional factor, there is a need for additional instructions as to how the pieces move. 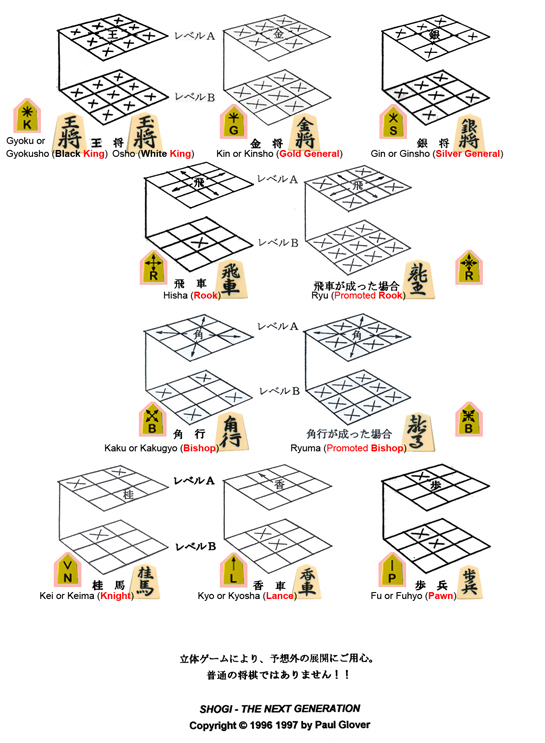 It takes the same amount of time and the same number of moves as regular Shogi. (Here’s a 2D game of Shogi download). The top and bottom boards each have 81 squares for a total of 162 squares. 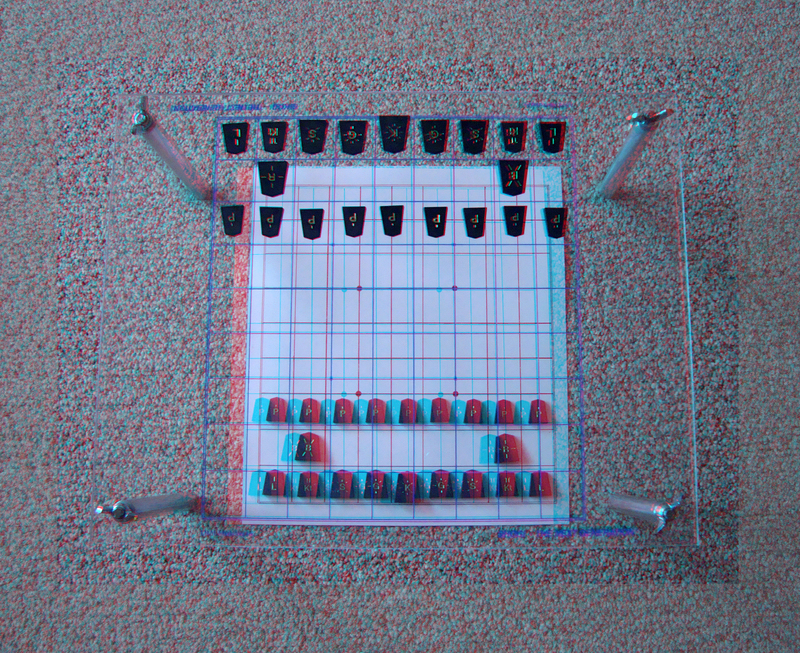 As with other 3D games, the Pieces are set up in this way: one player on the top board labelled “A” and the other player on the bottom board labelled “B” in their traditional manner. When you record a game as the game is being played out (Shogi notation), the board level (“A” or “B”) is written in front of the square named. Both boards have a promotion line. A previously captured piece may be dropped onto any vacant square on either level, and this constitutes one move. 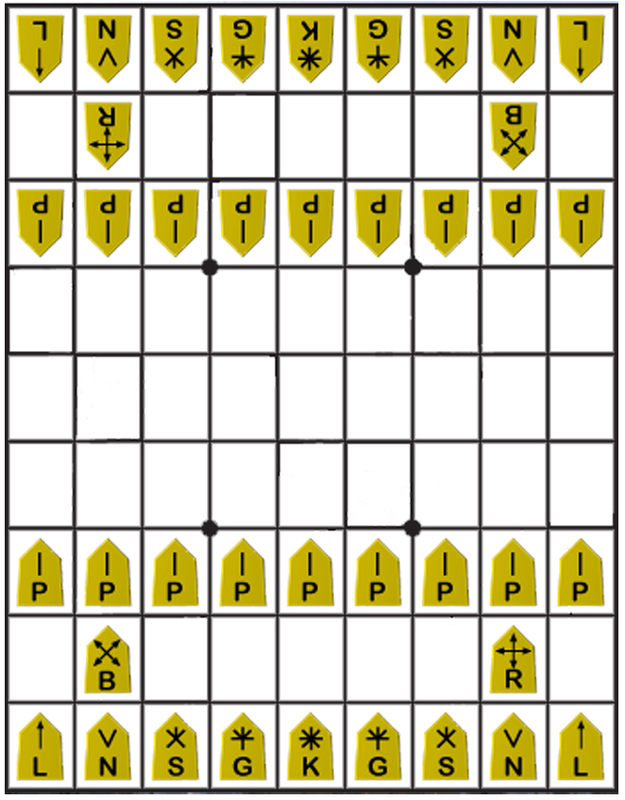 In the second game, each player switches board levels. All pieces, except the Knight and Bishop, can move to or capture directly below or above the square on which it is sitting. For the rest of the pieces, moving your piece directly Up or Down does NOT constitute a backward movement. K – KING: – (If, for example, it was on level “A”, second row) can move one square away from the square on which it is sitting. Therefore, the nine squares below it three in front, one directly below it, one on each side of it, and three behind it, are the squares it can move to. 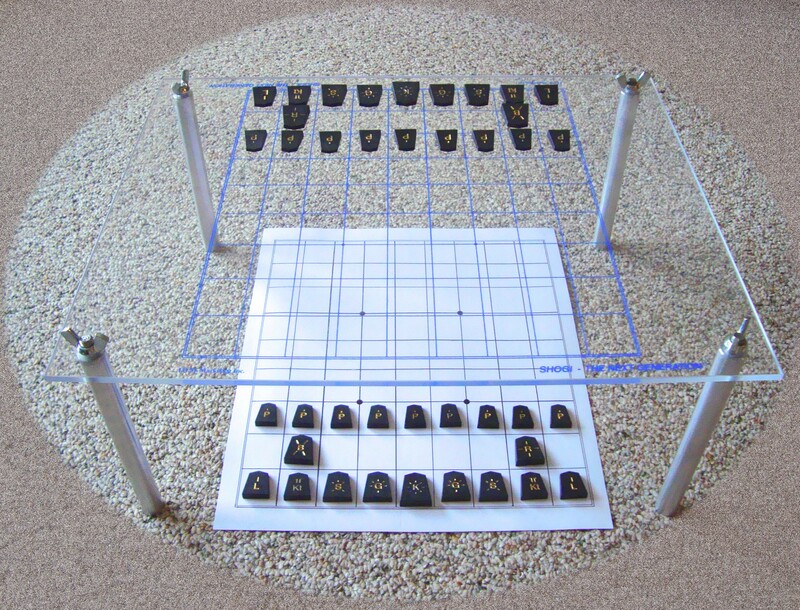 to move eight more squares for a total of nine squares, same as the Ring. G – GOLD GENERAL: – Can move one square away from itself in any direction except the two diagonal squares to the rear (a total of seven squares). S – SILVER GENERAL: – Can move to the three squares directly in front, one below, and the two diagonal squares to the rear (a total of six squares). Promotes as a Gold General. directly below the second square. Therefore moving like the shape of an “L” dimensionally. It jumps over any piece in its way and lands on the vacant square or capturing the opponent piece on that square. From it’s original position, (on “A” level) moving two squares forward, it would land on the square beneath the pawn on the third row. Promotes as a Gold General. of it (a total of two squares). It cannot retreat. Promotes as a Gold General. P – PAWN: – Same as Lance. The diagram below demonstrates if a piece was on the top board level, although the piece could also be on the bottom board level. It’s Not The Same Game! Something to Think-about . . . When playing regular Shogi (or 2D flat 1 board Shogi), you only have a certain amount of good opening moves to make. Some moves are bad moves or losing moves. However you must move the pawns to get things in motion. Therefore, you are limited to what you can play as a good bunch (1st five moves) of opening moves! 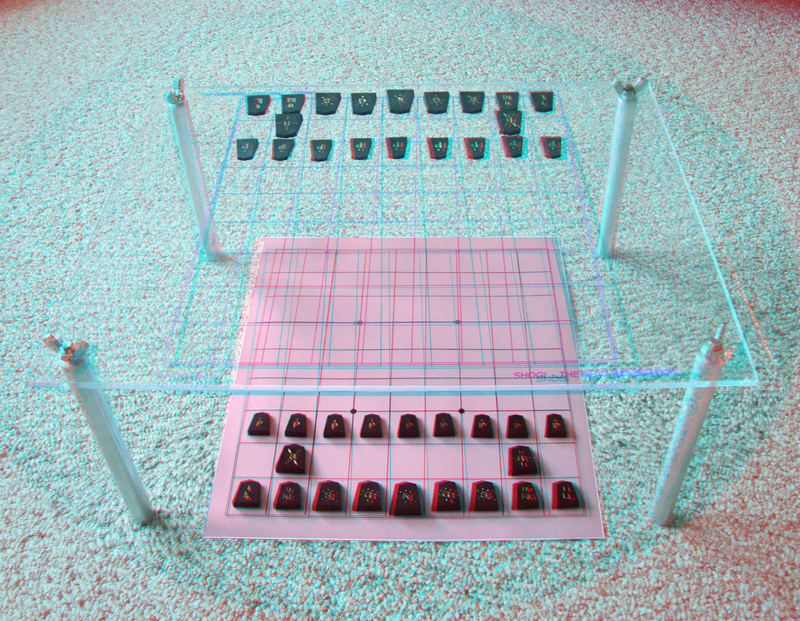 However, when playing 3D Shogi (or “Shog – The Next Generation”), you have 20 possible opening moves! There is also an incredible number of opening combinations (1st five moves) that would never have existed in regular 2D Shogi. This game gets you thinking up/down as well as on a flat surface, therefore in 3D! It will give your brain a real work-out like you’ve never had one before!